Wash the Chard. Blanch in a pot with boiling water and salt. Cook until tender and the stalks have turned sweet. Drain. While the chard is cooling slice 3 cloves of garlic very thinly. Slice the chard into small pieces. In a pan, heat some oil, then cook the garlic until tender but no colour. Add the spices and cook until fragrant. Add the chard and more olive oil, and season with salt. 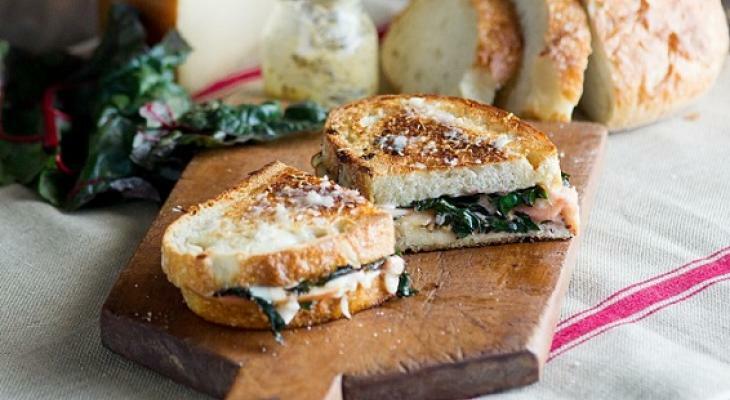 Assemble your grilled cheese with the cooked greens and comte, and then fry in the pan until crispy.